Gulf Shores has a humid subtropical climate, with long, hot summers, and mild and sunny winters. With bright sunny summers and warm winters, Alabama Gulf Coast weather offers year-round opportunities for beach, fish, golf, and enjoying life. Winters are generally mild and residents can enjoy outside activities the majority of the time. 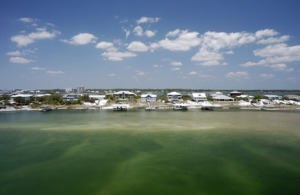 Ocean fishing, beaches, boating cruises, and especially golf are major draws for the area. Chartered fishing boats and cruise boats for sunsets, dinner cruises, dolphin watching, and water sports embark regularly, and the area is home to two of the top-rated golf resorts in Alabama - Craft Farms and Kiva Dunes. Listed below are other beach properties within a 50 mile radius of zip code 36542. No matter what time of year it is, most families are currently in the process of planning out their warm-weather excursions. Yet while some may think that they have to go to an exotic destination to enjoy a day of fun in the sun, there are plenty of great, closer summer locales, which is why we recommend booking a beach house vacation rental in Gulf Shores, Alabama. That way, travelers can have a great family vacation filled with lazy days on the beach and a lot of quality time as a family without having to stray too far from home! Gulf Shores is a charming beach community located on the Southern Coast of the Yellowhammer State. 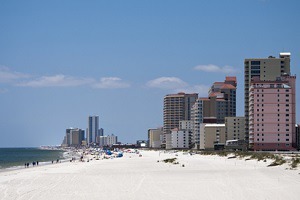 Gulf Shores is a very tourist friendly locale and is considered one of the finest coastlines along the Gulf of Mexico. The city's location creates a decidedly moderate climate that avoids the excessive heat common in other destinations in the area. There are also a wealth of things to do in the area, including historical sites like Fort Morgan, informational stops like the Gulf Shores Museum and family-friendly attractions like the Alabama Gulf Coast Zoo, making a Gulf Shores vacation rental a great way to spend your time during the summer months. So don't put it off any longer, book a vacation in Gulf Shores today where you can experience the best of the Gulf Coast and have a great time exploring the US's beautiful Southern state!